Office started life as a concession stand in 1981, with a name stemming from the fact that its shoes were first displayed on office furniture. This was just one of many reasons why it began to make waves in the London fashion scene and it would soon go on to open its own stores in the UK capital and elsewhere. Today, there are over 160 stores worldwide and Office continues to lead the way in compelling foot fashion both smart and casual. All your favourite shoe brands are here, including Dr Martens’ endlessly durable boots, Birkenstock’s funky sandals, Vans’ no-nonsense streetwear and classic Converse, Reebok and Puma pairs too. Head to the New in section to cut straight to the latest and best arrivals that’ll keep you on the right fashion track. Whether you’re planning for a night out, a night in, some casual hanging out time or if your shoe rack could do with a little refresh, Office is the place to be. Check out Office’s sale section for some great deals! Can I get Office gift cards? Where is my nearest Office store? Can I get a student discount with Office? Yes, enter your details here and enjoy a 20% discount. You can return your purchase with DPD within 28 days of receipt to receive an exchange or refund. Item must be in original conditions and packaging. Initiate your return by clicking here. Full policy here. What you put on your feet says a lot about you, so say it right with a trip to Office, one of the premium footwear retailers around. 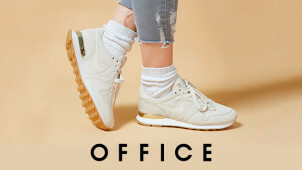 Whether you’re looking for some explosive heals for a night out or dynamic streetwear for casual fun, use an Office discount code from vouchercloud and you’ll get money off an on-trend pair of shoes. Its teeming with great deals on trainers, flats, Docs and more! Office’s app means its entire shoe collection (and believe us — that’s a lot of shoes) is now available in your pocket any time. That means whenever inspiration next strikes you, you’ll be ready to browse its range and have your new fancy footwear delivered straight to your door. The variety of payment options, including PayPal, makes it easier than ever to buy and you can even schedule to Click & Collect too. If you’re looking for some new activewear, we’d highly recommend Office’s range of trainers. With all the big names you’d expect, you can get a pair of shoes from the best at a great price, and adding an Office promo code from vouchercloud means you’ll make even more of a saving. The hottest street trends start at Office, so now you can get ahead of the curve with the latest Nike, adidas and Vans.